Last year, I traded my work with archived issues of Blake: An Illustrated Quarterly for new tasks in text and image markup of Blake’s illuminated books. Last month, I began writing markup “without a net,” as we say. With Katherine Calvin’s guidance, I am learning to describe individual watercolor drawings without recourse to a previous editor’s text. So, rather than thinking comparatively, I consider only the image at hand, and I have to familiarize myself more thoroughly with the body of search terms The Blake Archive uses to describe and tag images. Somewhat paradoxically, this move away from comparison has reinforced its value for analyzing Blake’s illuminated books, and has shown how rich these texts are for studying changes over time and across copies. This brings me to overwriting. In September 2017, I marked up Songs of Innocence, Copy Q, printed and hand-colored circa 1804, and now in the special collections of Syracuse University Libraries. I used as my template the Blake Archive Document (BAD) for Songs of Innocence, Copy P. Usually differences between copies are slight—a comma in Copy P may look more like a period in Copy Q, or a particular word may have printed more clearly in one copy than in the other. But in this case, comparing the second plate of “Night” showed a much more interesting change. In this copy, as in many others, the last six lines contain substantial overwriting that makes poorly printed letters legible. Most of this overwriting retraces the text that’s there, but occasionally the quill pen alters the printed lettering. For example, most copies, especially those printed in 1789, render line 44 as “Grase after thee and weep,” whereas Copy Q writes a “z” in dark ink over the lighter, printed “s” to form “Graze” instead. This is not a substantive change, and it is not unique to Copy Q. 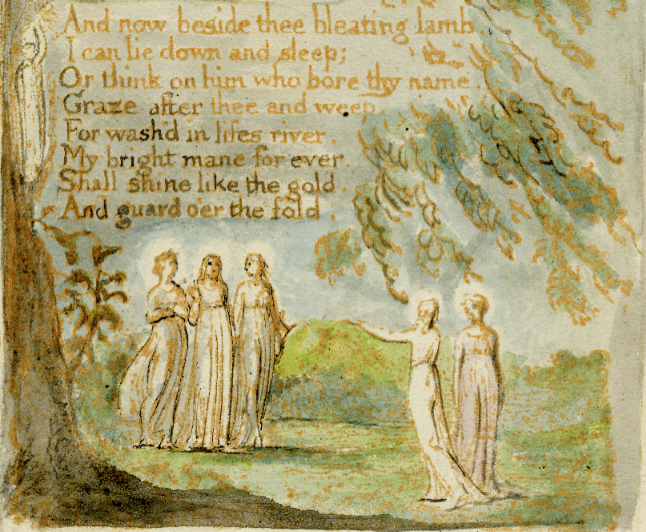 Take, for instance, Songs of Innocence and of Experience, Copy E, which Blake assembled for his patron Thomas Butts in 1806. For the “Innocence” portion of this copy, Blake salvaged poorly printed impressions from 1789 and retraced the letters by hand. As he did so, he overwrote “Grase” as “Graze” in the last stanza of “Night,” just as in Copy Q. The “z” spelling thus becomes an alternate in Blake’s oeuvre—one of many. And now beside thee bleating lamb. Or think on him who bore thy name. Graze after thee and weep. For wash’d in life’s river. My bright mane for ever. Shall shine like the gold. This change may seem slight, but it subtly alters the meaning of the poem’s ending. In the standard text of “Night,” Blake reinserts “I” in the final line, clarifying the subject after a long, multi-clause sentence. The speaker’s sleeping and thinking, his cleansing in the river, and his glowing mane all help define the image of him executing his shepherdly duty. But in Copy Q’s unique text, the absence of that reasserted subject attributes this guarding power to his “bright mane” rather than to the speaker himself: having been washed, the mane will “for ever . . . shine like the gold. / And guard o’er the fold.” The use of “mane” instead of “hair” already suggests leonine power and strength, but now the mane is figured as the source or repository of that power. The line’s alteration makes a synecdoche of what appears as a mere quality in other copies. Had I approached Songs of Innocence, Copy Q, in isolation, without the net provided by Copy P, I would likely have contemplated such an interpretation without pause. 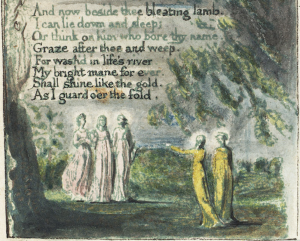 This is where comparison comes in, and this is why examining multiple copies of any given illuminated book proves essential to understanding Blake’s poetry. The Blake Archive facilitates this kind of comparison: while examining any given plate, users can navigate to the second row of tools beneath the image and click “Objects from the Same Matrix” to see all similar impressions. From there, users can select and compare individual objects to observe variations introduced by different coloring and, as I’ve described here, by Blake’s overwriting. With these tools of comparison, we can differentiate between poetic and material changes. Perhaps more importantly, we can begin to see the places where Blake’s methods of production cause the two to overlap. Mirror-Writing Marginalia — How Did It Happen and What Do We Do With It?